As we all know by now, it's really difficult to keep up with the fragrance world these days: so many new perfumes, so many new collections and companies and brands. Furthermore, work has demanded more and more of my attention over the course of 2015, so I'm feeling more out-of-date than usual. I became aware of Raw Spirit last summer when I spied two of the brand's fragrances at a Birchbox boutique in New York, but I didn't actually try anything from the line until this week. What is Raw Spirit? According to the company website, it's a project of Nomad Two Worlds, "a socially responsible entertainment and lifestyle brand, whose mission is to collaborate with Indigenous and marginalized communities to create culturally relevant contemporary art and entertainment and 'meaningful' luxury consumer products which provide economic benefit to our partner communities and further the public’s understanding and appreciation of the world’s most threatened cultures." Got all that? I'm not sure that I do, but I've been giving the fragrances a shot all the same. Two scents from the current Raw Spirit collection are meant to evoke Australian landscapes, and both include wild-harvested Australian sandalwood. They were developed for Raw Spirit by perfumer Harry Fremont. Desert Blush is described as "a warm, sophisticated, floral scent...inspired by the Western Australian desert at sunset, just before darkness falls." It features notes of osmanthus, jasmine, violet, boronia, ylang ylang, sandalwood, cedarwood and musk, and it smells earthy yet pretty. The violet is airy and mingled with a grassy note, and there's hint of fruitiness from the osmanthus and boronia. The woods are also light and semi-sheer. Desert Blush has a "natural" feel that makes it a perfect option for someone who thinks that most perfumes are too sweet and artificial-smelling; at the same time, it's interesting enough to appeal to perfume obsessives. Wild Fire, Raw Spirit's other Australian-inspired fragrance, is "a dry, woody, sensual scent...inspired by the intoxicating scent of the Western Australian outback in the intense heat of summer." Its composition includes notes of jasmine, ylang ylang, cedar, sandalwood (again, wild-harvested in Australia) and musk. Wild Fire feels like a bigger, bolder sibling to Desert Blush. The delicate florals have been removed, and the volume has been turned up on the sandalwood and cedar; the result is more androgynous and more linear, with excellent staying power. I surprised myself by enjoying Wild Fire even more than Desert Blush. I'm usually a soft-florals person, but Wild Fire's take on these woods — smooth, with a creamy undertone, yet also slightly rough-edged — kept me sniffing my wrist all day. I shared my sample of Wild Fire with a friend who loves woodsy fragrances like L'Artisan Parfumeur Bois Farine and Lush Breath of God, and she was very enthusiastic about it too. It's one of those scents that clings to scarves and coat cuffs and makes you smile when you catch a whiff of it the next day. All in all, I really like these two fragrances for autumn-into-winter wear, and I'm planning on trying more from the Raw Spirit line. Have you tried it yet? or have you made any other recent discoveries that you'd like to share? Feel free to mention them below! 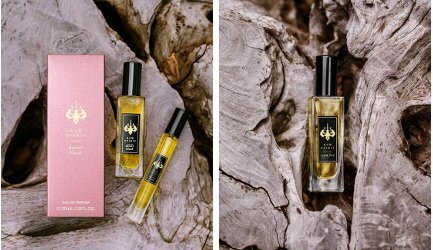 Raw Spirit Desert Blush and Wild Fire are both available as 7.5 ml ($40) or 30 ml ($90) Eau de Parfum, or as part of the Discovery Set (six 1 ml samples, $20). To purchase or to view a list of additional vendors, visit the Raw Spirit website. As noted there, a portion of the proceeds from the sale of these fragrances supports Indigenous Australian cultural projects. I am not sure “wild harvesting” sandalwood is more environmentally friendly than harvesting trees grown for harvesting. As for the long description of their mission, it sounds like a promise that the Australian “Indigenous and Marginalized populations”* should get a cut of the business. *I assume this means the folks which my sixth grade geography class referred to as the Maori. Somehow calling them “marginalized” seems insulting, but I am not up on Aussie cultural relations. I’m definitely not up on issues of Australian cultural identity, either…I’m still trying to figure out the backlash from Byredo’s A Rose by Any Other Name. Still, the people behind this business have traveled extensively, etc. so I’m assuming they know more than I do! Maori are New Zealand. Whole other story there. If and how that works is practice is hard to know. It’s one of those things that as a customer you have to take on trust. Anyway, I’m in Australia and for $20 and free postage I can get the discovery set. Seems like a good deal, a nice little extra Xmas present to myself. I’ll jump. I bought my husband a subscription to Donna Hay Magazine.. It reaches our shores every couple of months and costs a fortune… but I thought it would be fun to see some Aussie cooking. My fyi, is the Christmas edition has some very fun looking chocolate truffle recipes… If you like making candies for the holidays, you should keep your eye out for the magazine. I suspect many friends and family will be getting truffles this holiday from us! Hmmm … I’ll have a look for it on the weekend. Donna Hay is indeed a national institution here. I cook often from her book ‘Simple Dinners’. They are. Thank you for the clarification. Is there a polite way to refer to the Australian people whose ancestors were on the continent before the European immigrant/exiles? ‘Australian Indigenous people’ or ‘Indigenous Australians’ will do it. It’s a very ethnically diverse group, hundreds of languages originally. About 120 to 145 languages are still spoken. I hope you’ll like them! Some are perfect for warmer weather, some for cooler weather. I’m pleasantly surprised by this line. I love boronia in nature so am tempted by these fragrances. They do sound good…thanks Jessica. I need to smell some boronia oil at Enfleurage on my next visit, to get it full-strength!